Deepanjan Nag's Magnum Opus: Bought! Thanks to Jahnvee for the suggestion. It'll take me more than a year to complete this enormous book. Or it'll be a good practice for you to start reading faster! I'm going to hit the library soon and start reading this book as well..been putting it off for over a year now. Oh and you're welcome! Ma'am, I'm hurrying to complete An Equal Music by today. 80 pages to be covered...halfway through already. If the mission is accomplished-seems a definite possibility by extrapolation- it'll be a record! 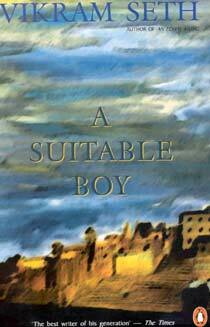 Nope, A Suitable Boy should not be insulted by such frenzied reading! Seth deserves some respect. And the size of the new book is intimidating enough! And how about buying the book? I'm pretty sure Seth's livelihood depends on the royalty he earns! some prestigious prize and he came up there with someone . he came up with his mom . he was with her and it looked sweet . and his mom was pround of him. anyway the author may not have been vikram seth , but he is a popular indian author , and did not look very old .writers should have beatiful thoughts , that person if he was vikram seth in the newspaper inspired me . comments too and was about to leave silently when the thought of vikram seth came and i felt to leave a comment ,sorry for coming here a chance accident.